Paisley Place Interiors has been serving Kitsap County and the Olympic Peninsula since 1992, offering slipcovers, upholstering, and custom soft goods. As a Custom Decorator, I have enjoyed assisting you with your homes, offices, boats, and weekend retreats. I am currently offering all the same services, but simplified, by spending time re-purposing old treasures, in my small home workshop and office. 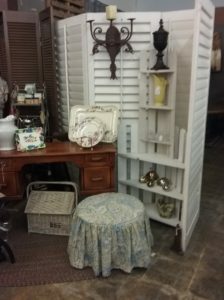 I come across old vintage home and garden goods to bring back to life and/or re-purpose them to a new useful item for a second go around. Saving useful items from the landfills (and occasionally from the side of the road) are kind of an addiction. When I see something that is “just too cool” to walk away from, …. I usually don’t ! I have expanded service to now include EZ Life Transitions.com, a move management company, that provides assistance with your life transitions. Whether you are moving from a three-story family home due to a death in the family, downsizing, or just want to declutter, I can help you with this. EZ Life Transitions, is a passion that arose when I helped my husband and his siblings close out their mother’s condo after her passing in 2009. I saw firsthand how stressful this can be for a family. They all had jobs and family commitments. I quickly realized having a third, unbiased, person come into this situation can be the best thing for everyone. Even in full agreement, this is an emotional time. Whether EZLifeTransitions.com is helping you with a big transition or we are just helping you declutter, we bring our passion for what we do to calm the chaos, making your transition as smooth as possible.